Join us this Saturday June 8th on top of the Pennington Street Garage downtown for a free show with Mitzi Cowell & The Valiants. A local favorite, they play tasty classic, obscure, and original blues with a swampy feel and a deep devotion to groove. The music starts at 6:30pm. Borderlands Brewing Co. will be serving locally made drafts on the rooftop at this unique venue with panoramic views. A portion of beer sales support KXCI. This event is part of 2nd Saturdays Downtown with fun for the whole family. 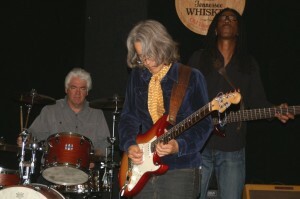 Hey Bucko!, The Kate Becker Band and Greyhound Soul play the Scott Avenue Stage. Cinema La Placita shows Pink Panther shorts on the outdoor screen. David Grisman plays The Fox in a ticketed event. Enjoy arts and crafts, food vendors, kids game and more at 2nd Saturdays Downtown, June 8th. Sponsored in part by KXCI Community Radio.